Texas Americana/Rock band Buster Jiggs Rocked Lajitas with a FREE outdoor show! The Pavilion at the Lajitas Golf Resort may be my favorite music venue in the Big Bend. It was refreshing to see and hear a rock and roll show out here – we’ve got plenty of talented singer/songwriters, but occasionally I do like to hear a loud guitar, meaty drums, and passionate vocals. Buster Jiggs’ songs are melodic. They would work with just an acoustic guitar. However, with a tight band rockin’ them, it made for an interesting experience. This was the first of this season’s free concerts at Lajitas – Alejandro Escovedo is coming soon. 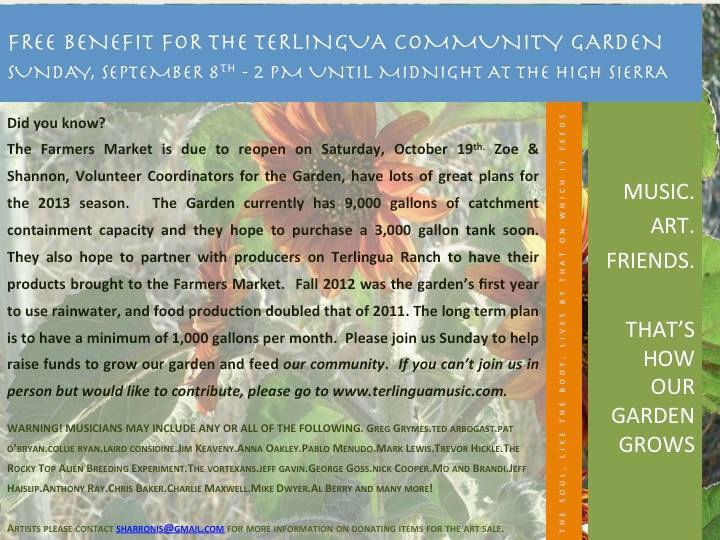 Last Sunday, 9/8/13, there was a FREE benefit concert for the Terlingua Ghost Town Community Garden at the High Sierra Bar and Grill. There was a lot going on in town this Sunday. A lot of the musicians who normally play were busy being movie stars. There was a football game. The High Sierra was absolutely packed- standing room only- by 5:00. By 8:00 the benefit was pretty much over. New! The Alpine Daily Planet has an article about the benefit. Click HERE to read it. The music was stellar, the auction rocked, and the community came together again to support a good cause. Shannon and Zoe were delighted with the over $500 that was raised. Then, Monday, Nick found a tip jar that was overlooked that had some more money – by the time it was all counted, over $700 went to the Community Garden. Don’t steal the posters until AFTER the benefit, please.